Vyatta software was a complete, ready-to-use, Debian-based distribution that was designed to transform standard x86 hardware into an enterprise-class router / firewall. Vyatta software includes support for commonly used network interfaces, and industry-standard routing protocols and management protocols. Unlike previous open-source routing projects, all these features are configurable via a single command-line interface (CLI) or web-based graphical user interface (GUI). Vyatta software was available as a free Community Edition as well as tiered Software Subscriptions that include maintenance, upgrades and support. Rate this project Stefan Gohmann has announced the release of Univention Corporate Server (UCS) 4.3-3, the latest update of the project's Debian-based distribution for servers with a web-based administration system: "Third point release for Univention Corporate Server (UCS) 4.3 is now available. It includes a number of important updates and various new features. 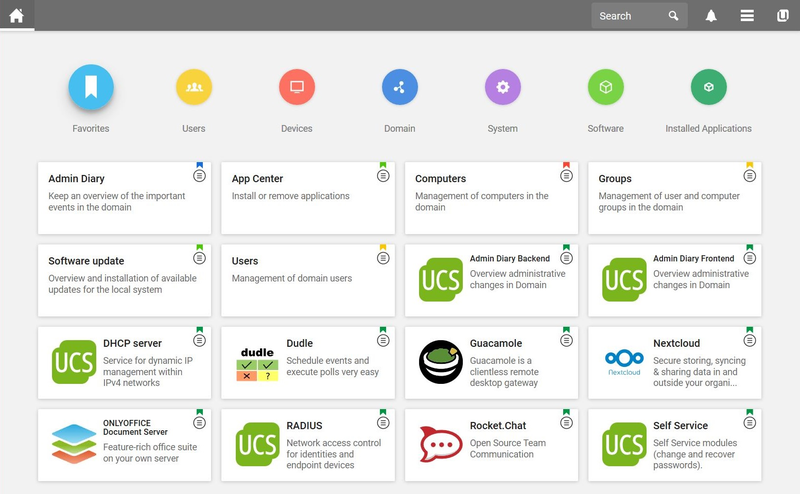 The portal is the starting point for many UCS users and administrators. As described in the blog article Design the UCS Portal with Drag & Drop, you can adapt it very easily to your needs. The 'Applications' and 'Administration' categories were static until now. We have extended the portal so that you can now define your own categories. In addition, you can add static links to the portal. In many environments different users should be shown different tiles. To do this, the group members for whom a particular tile is displayed are stored in the tiles. Previously, you could only assign each tile to one group. With UCS 4.3-3 you can now assign several groups to each tile. As soon as a user is a member of one of these groups, the corresponding tile will be displayed." See the release announcement and release notes for further information. Download: UCS_4.3-3-amd64.iso (1,225MB, MD5, pkglist). Univention Corporate Server (UCS) is a Debian-based server distribution that offers an integrated management system for central administration of servers, Microsoft Active Directory-compatible domain services, and functions for parallel operation of virtualised server and desktop operating systems. The Univention team has published a point release update for the distribution's 4.3 series, Univention Corporate Server 4.3-2. The new version contains mostly bug fixes and minor updates as listed in the distribution's release announcement: "During the upgrade to new UCS release- or patchlevel versions, the Univention Management Console is put into maintenance mode. While the maintenance mode is active, the progress of the update is displayed on a simple web page. Samba has been updated to version 4.7.8. For security reasons, authentication with NTLMv1 is no longer allowed. If there are still old systems or applications in use that absolutely need NTLMv1, this can be reactivated via the Univention Configuration Registry. The AD connector has been enhanced with tools to synchronize individual objects or entire subtrees again and to specifically remove rejects. 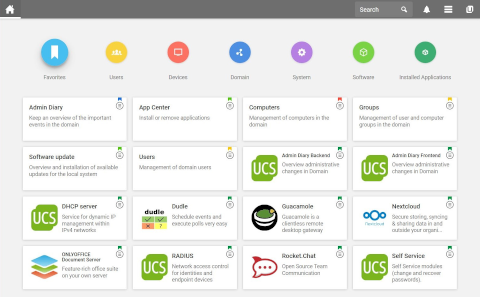 Various security updates have been integrated into UCS 4.3-2, e.g. Apache 2, the Linux kernel and Samba 4." The release notes contain further details. Download: UCS_4.3-2-amd64.iso (1,232MB, MD5, pkglist).